The results of the review will be used to identify the steps necessary to ensure such books promote peace and tolerance. Work on this topic will begin immediately, with results from the review available to the Palestinian Authority and partners by September 2019. The Palestinian Authority have agreed to engage constructively with the findings of the review. The UK will play a central role in the review process, and intends to commission the Georg Eckert Institute to produce an initial scoping report to expedite the production of the full review. The UK is rightly at the forefront of the international community on this issue. We are working closely with the Palestinian Authority to ensure that all Palestinian children receive a decent education and are able to fulfil their potential. 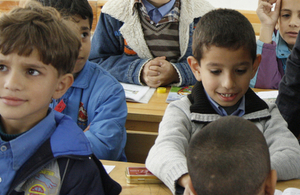 UK aid is helping to provide quality education for children in the Occupied Palestinian Territories, including through paying the salaries of specially vetted teachers in the West Bank. UK aid does not fund the writing or provision of textbooks by the Palestinian Authority, and all UK aid to the Palestinian Authority is subject to rigorous safeguards to ensure aid is used for its intended purpose. The Georg Eckert Institute for International Textbook Research is a leading international institute for analysing education media. It is a publicly funded institution based in Germany. The UK intends to commission this organisation to conduct an initial report into the best way for textbooks to be analysed.